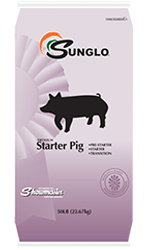 Pre Starter is a highly palatable product designed to encourage feed intake. It contains plasma proteins, lactose and milk proteins at levels needed by young pigs immediately post-weaning. It can also be used as a creep feed when milk supply is limited. Innovative Ingredients: Improves feed intake and performance. Tight formulation designs – in combination with ongoing world-class research – set a new industry standard for keeping your showpigs at the head of their class. Feeding Directions: Pre-Starter is normally fed for 5 to 10 days after weaning.